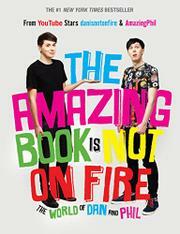 YouTube: You may recognize Dan and Phil from YouTube and be surprised to see them with their own book. Hoping to bring their fans over from YouTube to the world of books, Dan and Phil present a 225 page book of journal entries, anecdotes, selfies and photography, and colorful fonts. The only issue here is that Dan and Phil's fan base (while large) may be the only ones who want to buy the book. I had not heard of Dan and Phil, either as writers or YouTube stars, but I am not their demographic. For tweens and teens, I can imagine this book will be very popular as both boys and girls can connect with real-life people in personal ways. Creativity: ​Regardless of the book's fame, any reader who loves creativity will be drawn to this book. As a teacher, I could see my high school students using as a model for their own portfolios. What is easiest to like about the book is that no two pages are the same. With full page photography, fan fiction, quizzes, etc., a reader's eyes will have plenty of places to look and find interest. Connection: ​​Not knowing much about Dan and Phil, I can tell that they really care about their fans, and their wacky personalities are ones that many teen readers can connect to. With collage-style pages and family photos, they are reaching out to young people who may have self-esteem issues or just feel like an outsider. They're telling readers that it's okay to be quirky, to embrace it, to find a best friend who thinks like them.